Black garlic is enjoying a recent surge in popularity and this has spawned a lot of confusion as to exactly what is is and what its properties are and how to make it. 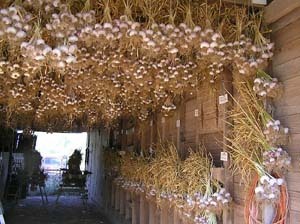 I will try to answer those questions here in this page as well as put in some ad-links to growers or others who sell black garlic. What Exactly is Black Garlic? Black garlic is any variety or cultivar of garlic that is s-l-o-w roasted at low temperature for a month or so in a humid oven/dryer. the garlic is essentially carmelized to the extreme and in the process turns black. It has a somewhat sweet taste and keeps for a year or more without refrigeration although it gets a little chewier as time passes and it dries out some. To me, it has the taste and consistency of licorice, which I like. Black garlic is a delightful snack that keeps well at room temp and it doesn't give you garlic breath. 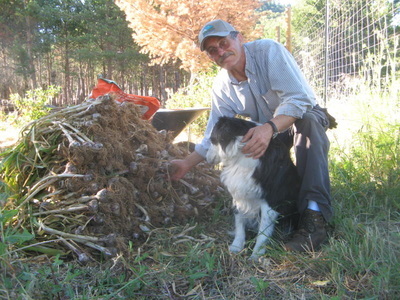 While there are a great many differences between the tastes of different varieties of raw garlics, I cannot tell any difference in their taste when made into black garlic and I have tasted 7or8, thanks to Kent Knock of Afternoon Zephyr Farm in SW Oregon. They all taste pretty much the same - great. Whenever whole, undamaged bulbs of garlic are cooked, no allicin forms. Since the raw garlic bulbs used to make black garlic are always whole and intact and never damaged or crushed, no allicin forms. Allicin can only form when cell walls are ruptured so the the enzyme, alliinase can mix with alliin in the white cell material in garlic and converting it into allicin. Black garlic definitely has no allicin or any of the fat-soluble smelly polysulfides that are the metabolites of allicin. Because of that, eating black garlic does not give one garlic breath. Studies indicate the antioxidant level of black garlic is three times higher than in raw garlic. Not being any expert on antioxidants, I will accept that claim at face value. Studies also claim to show the amount of S Allyl Cysteine (SAC) to be several times more than in raw garlic. Not surprising since raw garlic has none. SAC is water-soluble and is the breakdown product of garlic's interaction with either alcohol or a mild acid, like 5% vinegar. No explanation is made as to where the SAC comes from. Garlic pickled in either vinegar or alcohol both produce SAC. It is claimed that this combination of time, temperature and humidity ferments the garlic without any other processing and that the SAC is a by-product of this fermentation. Others say it is undoubtedly carmelized but is it fermented? For me, the jury is still out on this issue but I'm open to being shown reasons why there is SAC in black garlic and just how this fermenting process works. There are many different recipes for making black garlic and they run anywhere from 28 to 55 days at temperatures ranging from 122 to 155 degrees F and with many variations during the whole time. They all agree on one thing, though, and that is start with a lot of garlic because it shrinks and loses weight in the process - one says 15 to 20 pounds. Do you realize how expensive that would be at $16/lb? What if your attempt doesn't turn out to your expectations? Chefs say homemade stuff is bad to average and it is best to buy it from the people who are experienced, do it for a living and have the necessary equipment.